AH BOYS TO MEN 4 reporting for duty in 2017! mm2 Entertainment Pte. Ltd., a wholly-owned subsidiary of Singapore Exchange- listed mm2 Asia Ltd. (“mm2 Asia”) And JTeam Productions Pte. Ltd. (“JTeam”) announced two new productions today at Asia TV Forum & Market 2015 (an event of the Singapore Media Festival). Following the overwhelming response to Jack Neo’s ‘THAT GIRL’ in the SG50 anthology ‘7 LETTERS’, mm2 Asia and JTeam have begun development work to extend the short film into a feature film. ‘THAT GIRL’ is slated for a 2017 Chinese New Year release in Singapore. 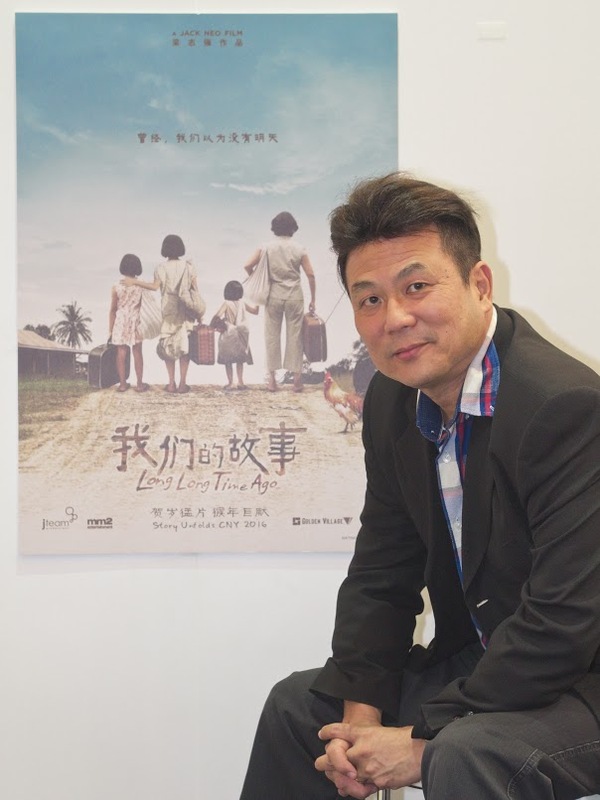 said Melvin Ang, Executive Director and CEO of mm2 Asia Ltd.
"Many viewers who watched the anthology film ‘SEVEN LETTERS’ were enamoured by Jack's nostalgic and bittersweet segment ‘THAT GIRL’, and they wanted to see more,” “This is a story begging to be developed into a full feature, and we're excited to go down memory lane again with Jack on a movie that builds on the magical spell cast by the original 'THAT GIRL'. After this year’s box office success of ‘AH BOYS TO MEN 3: FROGMEN’, production is set to begin on ‘AH BOYS TO MEN 4’ in 2017. Most of the cast from ‘AH BOYS TO MEN 3: FROGMEN’ are expected to return to duty in this new instalment. “Following the overwhelming response to Ah Boys To Men 3: Frogmen, fans have been looking forward to the 4th instalment of the franchise. This instalment will focus on NSmen and we are in talks with the Ministry Of Defence on which Singapore Armed Forces (SAF) service to work with,” said Jack Neo. AH BOYS TO MEN 3: FROGMEN SCALES NEW HEIGHTS! AH BOYS TO MEN 3: FROGMEN has collected a whopping RM3.33 million from 74 screens at the box office in Malaysia in 11 days! It has already surpassed the box office results of AH BOYS TO MEN (RM2.02 million) and will outshine the box office achievement of AH BOYS TO MEN 2 (RM3.50 million) in the next few days. After 39 days, AH BOYS TO MEN 3: FROGMEN has collected S$7.49 million in Singapore, shy of S$400,000 from the box office record of S$7.89 million set by AH BOYS TO MEN 2. The film producers are overwhelmed and extremely pleased with the impressive box office performance by the third installment of the popular AH BOYS TO MEN franchise in both Malaysia and Singapore. AH BOYS TO MEN 3: FROGMEN TO PREMIERE IN HONG KONG! Director Jack Neo and the main cast of AH BOYS TO MEN 3: FROGMEN will be making their first appearance in Hong Kong during the upcoming Hong Kong FilMart which is held from 23 – 26 March. The movie will be holding its premiere on 24 March. Director Jack Neo and the Boys will be attending the event to introduce Singaporeans’ favourite movie to our international guests including film buyers, distributors, producers and directors. As of 19 March, the movie has grossed S$7.07 mil at the box office. The film producers are overwhelmed and pleased with the impressive box office performance by the third installment of the popular AH BOYS TO MEN franchise. THE "AH BOYS TO MEN" FRANCHISE MADE HISTORY AGAIN! AH BOYS TO MEN 3: FROGMEN IS THE TOP GROSSING OPENING WEEKEND ASIAN MOVIE OF ALL TIME! AH BOYS TO MEN franchise made history again! The latest instalment of the franchise AH BOYS TO MEN 3: FROGMEN collected a stunning SGD $2.83 million in a short span of 4 days (19 to 22 February) during the Chinese New Year holidays! AH BOYS TO MEN 3: FROGMEN is not only the top grossing opening weekend Chinese New Year movie of 2015, it is also the top grossing opening weekend Asian movie of all-time! Mr. Melvin Ang, CEO of mm2 Asia Ltd adds, “We are highly encouraged by the opening sales at the box office and the reception towards the movie so far and we want to thank the audience for their overwhelming support. AH BOYS TO MEN 3: FROGMEN brings back the ingredients and laughs of the earlier two editions but with an added punch. We hope this will add some cheer to the festive season and we are confident this will be as well-received as the previous editions." HOOYA! HIGHLY ANTICIPATED SEQUEL AH BOYS TO MEN 3: FROGMEN RELEASES ITS MOVIE TRAILER! HOOYA! Local million-dollar Director Jack Neo returns with the highly anticipated AH BOYS TO MEN sequel, AH BOYS TO MEN 3: FROGMEN, which will be released island-wide during the upcoming Chinese New Year on 19th February, with sneak previews on 18th February! The movie features memorable characters from AH BOYS TO MEN and AH BOYS TO MEN 2 like ‘Ken Chow’ by Joshua Tan, the spoilt, rich kid who continues to ‘keng’ his way out of NS; ‘Aloysius Jin’ or ‘Wayang King’ by Maxi Lim, whose over-enthusiasm brings trouble to his cabin mates; ‘Sergeant Ong’ by Tosh Zhang, the strict and fit sergeant, and ‘Lobang King’ by Wang Wei Liang! “This is my third movie on army-training. However, what we are featuring (in AH BOYS TO MEN 3: FROGMEN) is very different from the Basic Military Training (BMT) in Pulau Tekong (in AH BOYS TO MEN and AH BOYS TO MEN 2)”, said Jack Neo. Besides the familiar faces from AH BOYS TO MEN and AH BOYS TO MEN 2, AH BOYS TO MEN 3: FROGMEN introduces new actor Wesley Wong, who plays ‘Black Dragon’, an aggressive gang leader who prefers to talk with his fists instead of his mouth. Together, these ragtag band of misfits must somehow survive 40 weeks of training in hell. Do they have what it takes to become one of Singapore’s most fearsome military units ? the frogmen? Filming was made possible with kind support from the Ministry of Defence, the Republic of Singapore Navy and the Naval Diving Unit. This will be the first local movie featuring Navy ships, equipment, and specialised diving skills. The boys portray elite naval divers, also known as “frogmen”, and prepared for their roles by undergoing a conditioning course similar to the tough training of the Combat Diving Course (CDC). HOOYA! "AH BOYS TO MEN 3: FROGMEN" IS BACK! The popular AH BOYS TO MEN franchise is back! Together with ‘Ken Chow’ actor Joshua Tan, they boys are putting on their diving suits bringing you the brand new AH BOYS TO MEN 3: FROGMEN! The movie is slated to be released in February 2015 during Chinese New Year! With a production budget of SGD$2.5million, the new movie stars the original cast from the AH BOYS TO MEN franchise, including memorable characters like ‘Ken Chow’ by Joshua Tan, ‘Aloysius Jin’ or ‘Wayang King’ by Maxi Lim, ‘Sergeant Ong’ by Tosh Zhangand ‘Lobang King’ by Wang Wei Liang. Not forgetting the veteran actors who also played significant characters in the franchise namely Irene Ang, Richard Low, Wang Lei and many more! Besides the original cast members, AH BOYS TO MEN 3: FROGMEN also features newly added characters including MediaCorp’s veteran actress Aileen Tan 陈丽贞, playing the role of Lobang’s mother, and Wesley Wong 黄恺杰, son of famous Hong Kong couple actor Melvin Wong 黄锦? ?/span>and Angie Chiu赵雅芝, playing the role of a gang leader called ‘Black Dragon’. The movie marks his acting debut on the big screen. Directed by local million-dollar director Jack Neo, AH BOYS TO MEN 3: FROGMEN brings the boys back to the days before their enlistment in AH BOYS TO MEN 1. Instead of going to Pulau Tekong for their Basic Military Training, they are being posted to one of Singapore’s toughest combat units, the Naval Diving Unit. Not long after graduating as naval divers, also known as Frogmen, the boys face their first test when a cargo ship is hijacked by terrorists. Will they be able to rise up to the real challenge? Filming was made possible with kind support from the Ministry of Defence, the Republic of Singapore Navy and the Naval Diving Unit. This will be the very first local movie featuring Navy ships, equipments, and specialised diving skills. The boys will portray elite naval divers, also known as “frogmen”, and prepared for their roles by undergoing a conditioning course similar to the tough training conducted during the Combat Diving Course (CDC). mm2 entertainment is pleased to unveil the poster for ‘Ah Boys to Frogmen’, a new installment to Jack Neo’s Ah Boys to Men franchise. The movie will begin production in August 2014. The original cast of Ah Boys to Men 1&2 will reprise their roles – this time as recruits of Singapore’s Naval Diving Unit (NDU). The movie offers a peek into the intensive training regime of the NDU, which have never been revealed so far. Together, the boys must survive 40 weeks of hell to become frogmen, one of Singapore’s most fearsome military units. The movie is slated for release in Singapore during Chinese New Year 2015.